In Igbo traditional setting, there is a special reverence, absolute importance, and indispensable responsibility, with which the first son of every Family is endowed with. These obligations are some times bitter as much as they are in most cases, enjoyable. No matter how cowardly, timid or poor some of these first sons may tend to be, there are critical moments when they must stand up in defence of their natural endowment and entitlement. Every first son that knows his onus, will always be at the forefront of defending his inferior siblings, parents and their collective inheritance from external aggressors or oppressors. They are so valued in a family setting, that their perspective on any motion or debate is highly influential, as parents see them as trusted special advisers who is capable of recruiting and radicalising his siblings to execute a grand plan successfully. The reason for this cultural tutorial is aimed at diffusing the propagation of some sponsored political e-campaigners questioning why IPOB should use Anambra state to kick-start its election boycott strategy of civil disobedience. Although IPOB may have a different reason, I am of personal opinion that there could have been no other better and worthy state to have spearheaded the Biafra restoration project other than Anambra. Anambra state, as we all know, is the most senior of all the states in Biafra land, being where Eri, the first son of Gad, the son of Israel(Jacob) had settled more than 5,000 years ago. This is in reference to the Agulueri and Umulueri Kingdoms located in the present day Anambra state. Based on this disputable historical antecedence, it therefore smacks of common sense for anybody to raise the question of why Anambra should be the first sacrificial lamb of IPOB election boycott order. 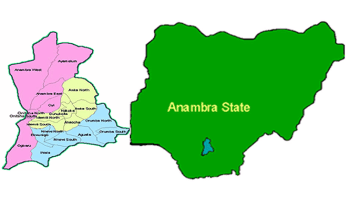 Anambra state is the mother of all other states in Southeast and a significant part of 'Southsouth' states; hence it is very much understandably indisputable for any person from Imo, Abia, Enugu, Delta, Ebonyi, and Rivers States to lay claim, that he/she is a descendant or product of the balkanisation of Anambra state, subject to the influence of colonial and non-colonial political actors. That notwithstanding, those questioning why somebody from Abia state should have the guts to declare election boycott in Anambra, should have it in mind that apart from the fact that Nnamdi Kanu has remarkably filled the vacuum left by the late Odimegwu Ojukwu as a Biafra leader, we all must not forget in a hurry that Abia state was once part of Imo state, while Imo state was once part of Anambra state. Anambra as the mostly elderly of Biafra land, is saddled with the opportunity of paving the way for Biafra restoration, and there is no better way of achieving such historical feat than for the people of Anambra to prove that destiny is created and not inherited. A total boycott of the upcoming gubernatorial election will place the landmarks of this generation of Anambra populace in the sands of time. The burden of Biafra restoration project now lies in the hands the people of Anambra. Whether they will uphold and live up to their birthright, or sale it for a porridge of yam, is a story yet untold.